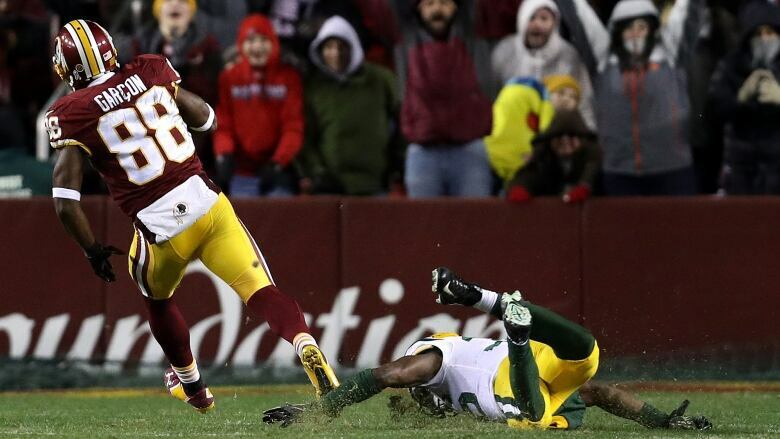 Kirk Cousins went deep late and often, throwing for 375 yards and three touchdowns to lead the Washington Redskins to a 42-24 victory over the free-falling Green Bay Packers on Sunday night. Kirk Cousins wondered early in the Washington Redskins' game against the Green Bay Packers if the wind would make it difficult. With Cousins carving up Green Bay's porous pass defence and Robert Kelley running for 137 yards and three touchdowns, Washington put up 517 yards didn't wilt like it did in a playoff loss to the Packers. "We Want Dallas" chants filled FedEx Field in the final minutes of the game that only became a blowout late, but this was a well-rounded performance that the Redskins wish they could've put together in January. While the Packers allowed 30 or more points for the fifth time in six games — all losses — Rodgers and the offence couldn't keep up. He was 26 of 41 for 351 yards and three touchdowns, but the result was the same. FedEx Field in the final minutes after Cousins completed a 53-yard pass to Crowder, and Kelley got his third touchdown. The Redskins have a quick turnaround as they visit the Cowboys on Thanksgiving.